About Ardmore... it's authentic! And so are its' people! 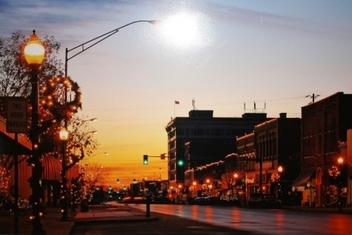 It is just a slice of small town life... and worth a peek. You'll be surprised. Located halfway between Dallas and Oklahoma City, it's a great 90 minute getaway. Dallas was my home for many years... and I loved every minute of my mostly sparkling life there, but I know, sometimes you just have to get away... to something less dense... to either explore, or perhaps remember, what small town life is like. Ardmore is that kind of place. I renovated a 1930's cottage and opened Maria's Garden 15 years ago. I am so very lucky, to absolutely love what I do and what I've created... it is most certainly authentic and unique! We've made so many friends that return to visit family, and Ardmore is known as the spot to "Meet in the Middle." I think those returning friends, always interested in the store, and our community, helped birth the idea of the Guest House. Come for a rest, or a gathering... you'll love it!